Important news relating to the DV Info Net site and these message boards. I just wanted to post a few thoughts after returning from NAB this year. 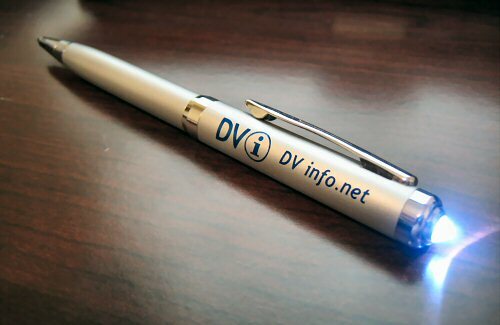 First, let me just say that I met Chris Hurd while attending the FCP Super Meet in Las Vegas and in addition to be a really nice guy, he gave me a DVinfo.net writing instrument. Now this is no run of the mill writing utensil. First of all, the DVinfo.net logo is prominently displayed in DVinfo blue on its silver alloy colored side. The pen is accented with precision pollished chrome writing tip, pocket clip, and matching bands at each end of the pocket clip barrel. The writing tip is a fine point roller ball good for getting small print into small places like the lable of a Mini DV tape. The cartridge extending mechanism is a true fluid movement, on par with any of the Sachtler or Miller heads I scoped out at the convention. And here is the real kicker, cleverly and discreetly disguised as pushbutton cartridge extending mechanism at the end of this precision writing tool is a powerful daylight balanced led light, powerful enough to be used as a backup key, fill, or hair light in a pinch. We have used it a number of times in leiu of a reflector when shooting on bright sunny days outdoors. Chris, the only suggestion I have for the next model is the addition of barn doors and diffusor kit. the only suggestion I have for the next model is the addition of barn doors and diffusor kit. It is my understanding that the whole industry is moving towards HD, so I might wait a little while before I upgrade my current pens...at least until Chris is able to find a suitable distributor for the 'next-gen-pen'. I am a sucker for sentimental attachments to functional hardware....Hell, I was still using feather quills until two years ago when my neighbor (who owned the chickens) told me she was going to call PETA if she caught me reaching through the fence again. I just hope that when I get the HD pen I won't have to upgrade my entire stock of office paper. I've already switched to 16:9 paper but wish the paper industry could decide on a universally accepted paper stock. I've already switched to 16:9 paper. Yeah, what an amazing difference huh? I was stuck in the 4:3 paper mode for so long everyone used to ask me, "Hey, you into scrapbooking or something?" Hey, wow, that was my 360th post...looks like I've come full-circle. You know these trade shows are all about the swag. Nice to meet you, Dave! When it falls apart let me know and I'll send ya another one. Wow! That made my lightscribe burner jealous...ha, lightscribe....get it? All kidding aside, that IS a sweet lookin' pen. Hopefully I will be able to swing a trip out to NAB next year. You gotta meet me at one of the shows... or if I can afford to have enough of 'em made up, might offer them for sale on the site. About time we had a swag shop around here anyway. So... where do we send the money Chris? Ok, I'll trade you my Gl2 for one................ just kidding. I'd buy a couple as well. Geek is chic.